UFT is everywhere. Retirees are in Iowa, NH, will be in SC. Michigan—UFT is in Detroit. Industrial hygienists blocked from school entry. Hoping they will get in and show what needs fixing. Mentions man in charge of Detroit schools was also in charge of Flint, glad he’s gone. NYS UFT standards committee full of volunteers, all school levels, special ed. and ESL represented. Will meet first time tomorrow. Were many volunteers. Met with company implementing new test next year, Questar. Says teachers will work with them, 60 elementary ELA and 60 elementary math teachers. Asks that applicants email VP Evelyn de Jesus. GEA v. CFE, both about school funding. CFE said schools didn’t get enough funding. GEA made cuts to many districts, causing layoffs. Mulgrew says most GEA money doesn’t go to needier districts. When will they fulfill promise of CFE? CLs will be notified how much each school has been shortchanged. Anti-creaming language v. charters getting more money. Elia just went to charter rally. 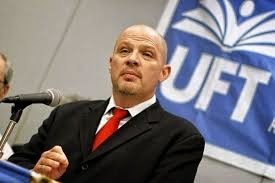 Mulgrew says UFT not talking charter caps or charter funding. Only wants charters to take same kids public schools do. Mulgrew says state senators now interested in student learning, and that things like portfolios may be used in lieu of test scores. Says there must be specifics, that we are being strategic and pushing this. Hopes to go to NYSUT board of directors and locals and get them to push state toward changes in definitions of learning. Says state is waiting for teachers to tell what student learning is. Says we must propose alternative to testing. Mayor’s task force on discipline—went from zero tolerance to zero discipline, and that we’re looking for place in middle. Says zero anything does not work. Says Cuomo has no idea what’s going on because he doesn’t spend time in schools. Says he’s now taking cues from de Blasio, e.g community learning schools. Mulgrew supports whole school cultural approach. Says negotiations have begun, non-union construct won’t work for us, but we need to decide what to give back for it. Says governor is now in on family leave act. Says we know it will cost, but no one should profit from it. Mulgrew announces we are halfway through. Says Monday is Lunar New Year. Mulgrew’s advice to those upset about school opening Monday—shovel. Says more schools are being visited to help build functional chapters. Says problem is when school is functioning they won’t let advocates go. Mulgrew says he’s been yelled at, doesn’t specify why. Some classes dropped for snow, but classes have been full, oversized, and he’s adding ten new ones. Says renewal schools program is something to be proud of. Doesn’t know if they will all survive. Wants us to talk in terms of great problem in public education for 50 years that no one has solved. No one knows how to work with groups of schools that all have intensive poverty around them. Says Title one was just for this and it hasn’t solved it. Says Bloomberg tried to solve it by attacking us in various ways, but it hasn’t worked. Mulgrew says with community learning schools we’re seeing results we haven’t seen before. Says it’s huge piece in bigger picture, and that we have more such students than anyone. Speaks of renewal retreat, to which 50 schools came. Says dealing with those challenges is probably toughest educational job in the country. Says if we solve that we will have solved the great problem that has never been solved. Says DOE didn’t want to come to weekend, but chancellor came when she found out. 19 principals followed. Says if you mandate it it doesn’t work. Says communities can make things happen, if supported. Mulgrew says it’s not about passing percentage, but is impressed when traditionally low-performing schools do bettter. Says PROSE schools are about collaboration and trust. Says they’ve accomplished very good things in 5 months. Mulgrew says this is against his judgment and opinion, but shows video. Complains there is no volume on video he doesn’t want us to see. Mulgrew shows us the six-minute video of him talking to various Unity Caucus members, but the technology fails. Mulgrew decides to keep talking until video is fixed. Says he doesn’t watch NY one, but trails off before telling us about other sources of info he ignores. Says it’s very simple. SCOTUS can say union members are no longer union members. Says it’s about bad people who don’t like us because we stand up to them and win. Says it’s about people who think we should all shut up. Says first, we need volunteers to sign up on an action campaign about Friedrichs. Wants members to all get info in February. Asks all DA members to sign up right now to be “activists.” Many phones come out and many clicks are made. Mulgrew says all members on list will be asked to sign. Says we will do “all the grassroots stuff” we’ve been doing before and push it onto our social media platform. Goal is we start today to push everyone to work in some sort of organized fashion so that by May we have maximized energy. Union loud and proud buttons are distributed. Mulgrew makes many jokes about who should and should not receive them. Mulgrew says Friedrichs is much better understood by members, says more people understand. Says phase one is moving grassroots forward, and that we always do that first. Says schools will come up with great ideas. Says in March we will educate members on who’s really behind Friedrichs. Says we’ve beaten them in White House and Congress, and now in State because we now have a governor that loves teachers. Calls it clever insidious attack. Says these people have destroyed communities across entire country and that they have no remorse. Says we will combine with other unions. Mulgrew says someone from here will send it out, like always, asks us not to send it out. No idea what he doesn’t want sent out, but it’s clear who he’s attacking. He says just like family leave we have to figure out how to fund it, talks about discrepancy in pay in right to work states. Says we need to be talking about not backing down, standing up to them. Says if decision goes south, we’ll work really hard to do what we have to do. If not, we’ll go have a drink. Says sometimes we take it for granted. Points out he’s saying it nicely. Says this is something, look what happened in Wisconsin, well-prepared unions are OK, others are gone. Says we need to take active role as leaders. Says we will set up Friedrichs teams in schools. We don’t want to be only big union still standing and surviving. Says it is great challenge. He has confidence if things go badly we will be alright. Says we’ve been fighting them for over a decade. Recalls Bloomberg layoff threats, and seniority threats, says it was multi-million dollar campaign financed by same people. Says we want other unions to join us, and that we are champions for equality. Ends his report, saying we don’t have to watch the video. —mentions school counselors week, to applause. Mulgrew informs us it’s February, African Heritage Month, CTE month, Groundhog’s Day, Dominican Heritage month, Lunar New Year Holiday, and Valentines Day. CL—NYT article about pensions in bad shape. Mulgrew—not in bad shape, doing well. Pension rep says they are solidly invested, very strong. Says there were a few headlines. Attributes results to everything happening in manufacturing today. Says every new comptroller has questions on how to run retirement system for best results. Says for every single person in this room, when they earn their pension, there is sufficient money to pay all because of teacher trustees. Mulgrew—says we resolved to advocate, that we’re no longer recruiting from middle America. Leroy Barr—says we’ve been investigating, trying to increase pipeline both short and longterm via organization that follows potential teachers, TSTT, with 600 possible alumni. Also working with DOE, and in last 4-5 months they have a pilot program called Educators Rising. Establishing relationships with CUNY and SUNY. NYC putting $16.5 million toward this, for 1,000 teachers of color in Fall 2017. Says nationally, President running program as well. CL—Asks if he can give principal button and whether he can wear it during school day. Mulgrew—Yes, give button, and technically no on wearing it. Delegate Brooklyn Tech—Says course preferences and assignments are discriminatory—If we uncover these patterns in one school, can we make citywide campaign against racism and sexism in schools? Mulgrew—This is about school communities, which may handle things differently. These things need to come from schools. Some need outside help while others don’t. Says we have no difficulty dealing with difficult subjects, but must be at school and community level first. Not good when people come in and lecture. CL—What happened to Campbell Brown case? Mulgrew—It is at appellate division. Appealing whether it should be dismissed. Says it’s a state legal issue, not a Campbell Brown issue. CL—Asking about removal of timing from state tests—have there been discussions about implementations. Mulgrew compares her to Yogi Berra—test shorter but no time limit. We will have to decide whether students making meaningful progress and should continue. Make sure administrator is person stopping test if necessary. Mary Ahern—motion should be made, should be seconded, says this is not membership meeting but delegate assembly. Mulgrew goes to parliamentarian. Says he will present, there will be a second. Will be open for debate. Workplace bullying—UFT will use its resources to support NY healthy workplace bill to give victims cause of action. Mulgrew says this has got to stop. Says member is yelling from the floor. Says we will run meeting and move forward. Leroy Barr—point of order—challenges open debate on motions. Says there is past practice of 30-40 years of how we deal. Says Roberts is great guide, but not everything is in there. Asks that every motion directed to agenda is not open to full debate. Says it’s unthinkable we would have debate about something not on agenda. Asks for ruling from chair. Gets much applause. Chair, Mulgrew, says we will follow past practices. Asks for vote of the body, as ruling was challenged. Ruling of chair overwhelmingly approved by body. Speaker says workplace bullying basically legal, and that this bill provides recourse. Mulgrew—says he likes title, but would like to vet bill. Asks that legal team work with speaker and that vote be suspended until next month. Jonathan Halabi—motion to extend 5 minutes. Defeated. Paul Egan asks for endorsement of Rafael Salamanco. Says he’s endorsed by many unions, was liked in interviews, and Bronx office strongly supports. No speaker against. Mulgrew moves to close debate. Passes overwhelmingly. TRS—Mel Aaronson—Regrets retirement of Sandy March. Says our pension system would be different without her, benefits and service would have suffered. Says Debra Penny good replacement. Asks for endorsement. Sandy March speaks, thanks body, says we are luckiest people in the world because our leadership always put pension and retirement security in forefront. She receives standing ovation. Mulgrew takes personal moment, calls Sandy a piece of work, but our piece of work. Says she’s always gone after anyone who’d put union in jeopardy, says we owe her a great debt and thanks her. Mandate relief—Carmen Alvarez—Says in 1995, state wanted to lift limits, but parents fought it. Says we could not prevail on resource room or SETS. Says we went from 5 to 8 to 1. Says we should roll back group size from 8 to 5. Says caseloads should go down as budget crisis is over. We have 963 million dollar surplus. Passes unanimously. Resolution for mandated enrollment for paras in TRS. S. Abrams speaks of members retiring who aren’t in pension system. Says it’s time for us to bring members on board and we must pass bill this year.